Frida, from the @fridaflaquita Instagram. Dakarai was my gateway dog. A lovable blond mixture of numerous unknown breeds, Dakarai belonged to our neighbors in the duplex where my boyfriend and I lived in a neighborhood on the Oakland/Emeryville border, just across the bay from San Francisco. When his owners left for work, Dakarai would head over to our unit, let himself in through the doggie door, and bound up the stairs to our bedroom, ready for a day of adventures. Since my boyfriend was in grad school and I had a flexible teaching schedule, at least one of us was home most of the time, and we were happy to take him on runs and to enjoy his sweet presence while working at home. We even dogsat Dakarai when our neighbors were out of town. Though I didn’t grow up with pets and had never owned a dog before, I became smitten. We had the benefits of dog ownership without the vet and food bills. It seemed to be a perfect match. Then our neighbors broke up, and Dakarai’s mom soon announced that she was moving out of the area. She must have seen the crestfallen look in my eyes when she gently said, just before getting into her U-Haul truck, “Maybe it’s time for you to get your own dog?” My boyfriend and I had discussed that possibility for many months, and browsing Petfinder had become a nightly bedtime activity. I was on sabbatical and would have a few months before returning to teaching to help a new dog adjust, so it seemed like good timing. 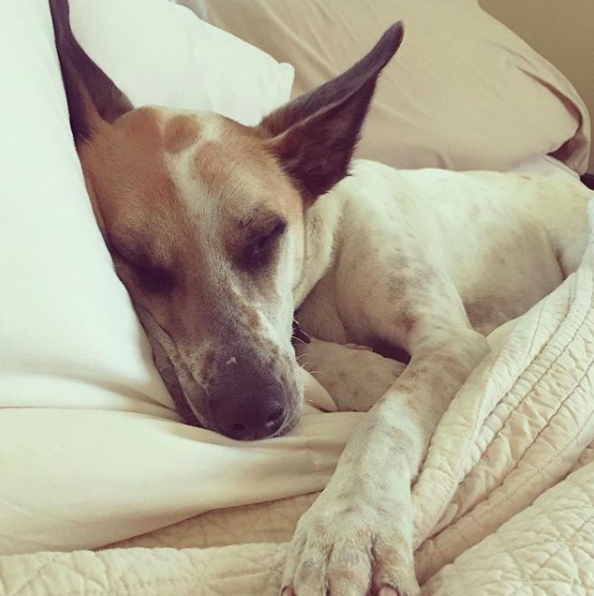 A few weeks later, we came home from Tony LaRussa’s Animal Rescue Foundation with Frida, an energetic, curious, high-strung creature whom the shelter guessed was part Ibizan hound and part Australian cattle dog. She seemed to bond with us quickly, sleeping at the foot of the bed and eventually making her way under the covers, where she still sleeps with us every night. But we noticed fairly quickly after bringing her home that she became unglued when we left, even for short periods of time. We would return to blood-stained walls, soiled floors (even though she was housebroken), destroyed blinds, and a hysterical, panting dog whose Kong was left untouched. She exhibited all of the classic signs of separation anxiety, and suddenly the writing projects I had planned for the last part of my sabbatical were eclipsed by desperate calls and emails to trainers who could help our sweet dog. It would be several months before we could leave the house secure in the knowledge that she would not jump out of our second-story window, scale the 6-foot fence around our property to take herself to the dog park (across a very busy four lane road), or go on a three-hour walkabout in the neighborhood only to return with a huge grin scratching at the front door right around dinner time. Thanks to trainers, books, and advice from other dog owners, over the past three years we have been able to help Frida stay safe and relatively calm, even when she is alone. I sense that separation anxiety is never cured but managed, and we have been able to manage it. Being calm and consistent in our routine has been key in our journey with Frida, and consistency was definitely on our minds when my boyfriend and I received word from our landlord that the he planned to sell the rent-controlled duplex where we had been living for the past five-and-a-half years. A quick scouring of Craigslist revealed that renting a comparable two-bedroom apartment in the area that allowed dogs would have cost us nearly twice our current rent. We weighed our options: we could dig in our heels and remain in the unit through the sale of the property and then hope that the new owner wouldn’t raise the rent to market rate; we could look for a smaller apartment in the area and pay more for less space; we could move several miles farther away from San Francisco, which would make my already challenging commute even more challenging, but would keep our monthly rent about the same; or we could see if our landlord would be interested in selling us the property. I’ll break the suspense: reader, we bought it. By Labor Day of that year, we had closed on the duplex. Our neighbors became our tenants and we survived the harrowing home-buying process. I am profoundly aware of how privileged we are to own property in the San Francisco Bay Area, which boasts the highest cost of living in the United States. But I remained anxious, stressed, and ambivalent throughout the whole process. One of my friends calls herself “The Reluctant Homeowner,” and I am definitely a member of that club. I tend to be financially conservative. I like knowing that I have a large cushion in case of emergency, and I don’t like to keep a credit card balance. The thought of taking out a thirty-year loan, paying semiannual California property taxes, and committing to a lifetime of home improvements ranging from a new roof to a new garbage disposal made me queasy. Not only would we be homeowners, but we would be landlords, responsible for the large and small issues that arise in any rental unit. But I also knew that this was an opportunity we could not pass up. Our former landlord was offering us the property below market value, knowing how much he would save in realtor’s fees and renovations costs from not putting the duplex on the market. Not having to compete with prospective buyers who could make cash offers on a Bay Area property was a huge boon in this situation. Moreover, although landlording can be a challenge (and for the record, our tenants are delightful, responsible, and a joy to live next to), having someone else contribute to mortgage payments was definitely attractive. Finally, as a tenured professor, I knew that I was going to be in the Bay Area for the long-term. It made sense to start building some equity in this expensive area where I plan to be for the rest of my career. For all of these reasons, despite my uncertainty, the purchase made sense. Now that I’ve had almost six months to settle into homeownership, I am feeling better about this plunge we’ve taken. I am grateful that we were able to stay in the house and neighborhood we had grown attached to, and I am especially happy that Frida has continuity in her life. My boyfriend and I sometimes tell Frida that we bought the property for her — and we are only half-joking. While there were certainly other factors that influenced our decision, providing stability for her definitely loomed large as we weighed our options. Even though separation anxiety can flare up when a dog’s family moves to a new place, I’m sure that we would have figured things out. Frida would have adjusted. We don’t know much about her history except that she was a mangy and underweight puppy wandering the streets with her sister before being rescued by the amazing people at TLARF. But I’m guessing that her early life was far from easy, and we want to do whatever we can to make her feel secure. Even after she takes her final romp through the local hiking trails she loves so much, this will always be Frida’s house. Sarita Cannon is an English professor and a self-taught expert on canine separation anxiety. She documents Frida’s exploits on Instagram @fridaflaquita.